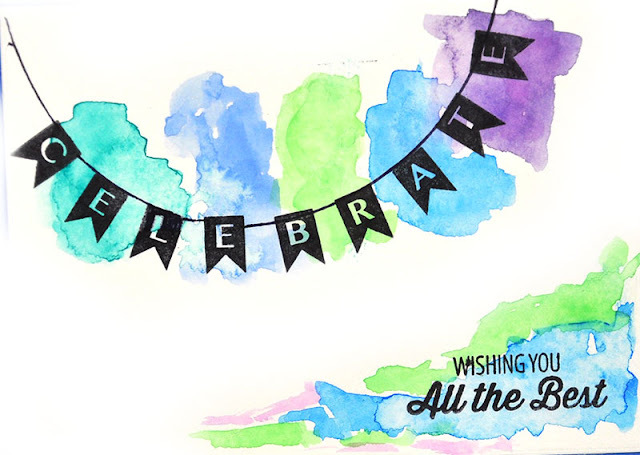 I love making cards. 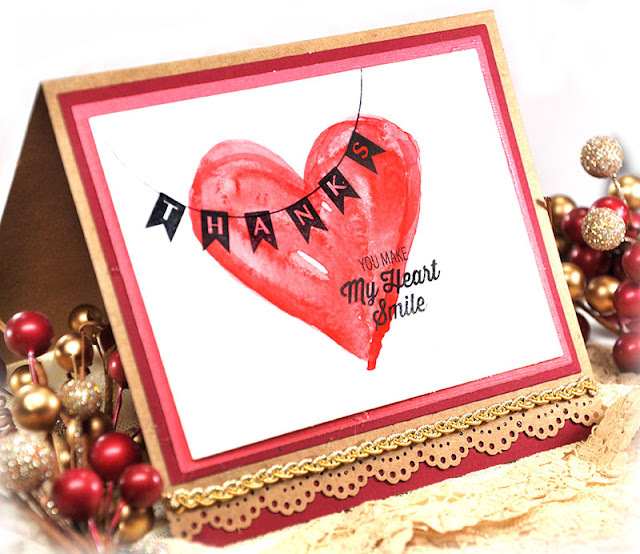 Mine tend to be ornate and embellished and quite decorative but I'm really starting to love simple, quick cards that people can actually make with minimal supplies. That's exactly the beauty of stamps. They can be used over and over again...and with the Planner Banner Stamps by JustRite , the possibilities are endless for personalized thoughtful cards. I do have some tips and a simple step-by-step to share that will make the process go quickly and successfully. If you scroll down a bit, you'll see all three cards I made as samples to demonstrate the the versatility of the Banner Clear Stamps. Here is an image of the JustRite Planner Banner Alphabet Clear Stamps . Fun right? Step 1. 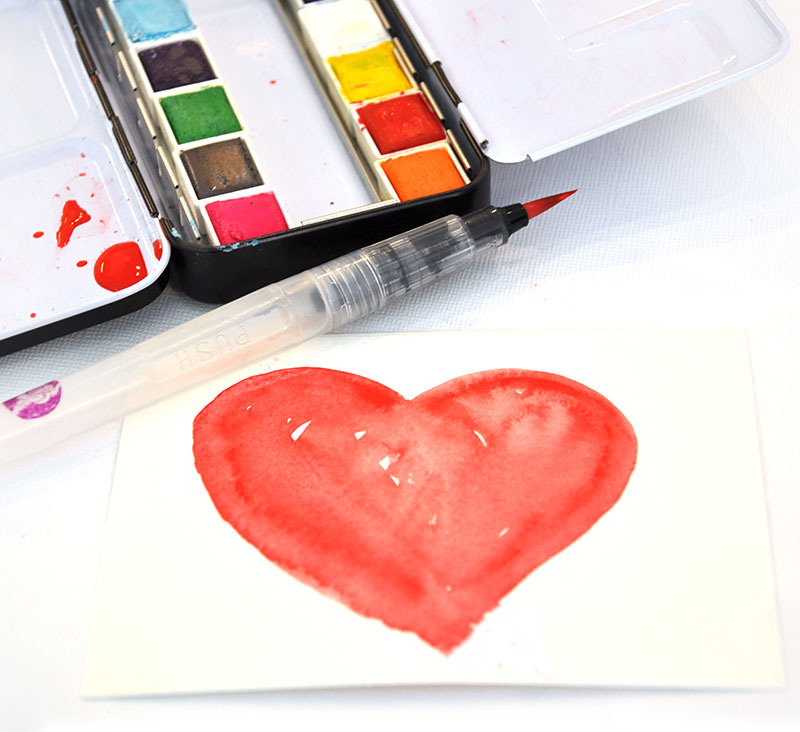 Paint design onto watercolor paper. 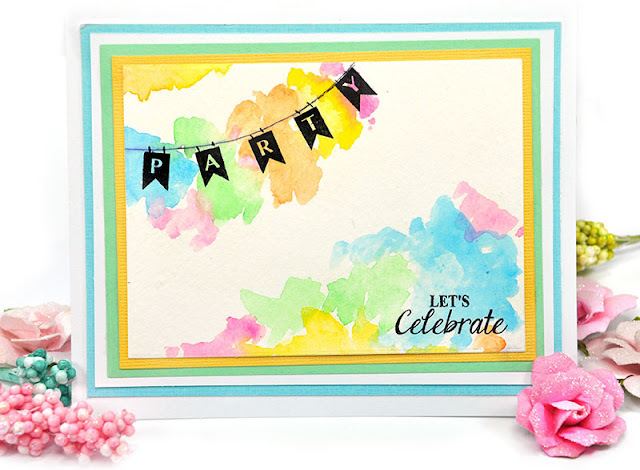 I am using Prima's Watercolor Confections - Classics set, along with the Prima waterbrush. It's really important to let this dry completely. You can dry with a heat gun if you have one available. Watercolor paints really do work best with watercolor paper. Step 2. 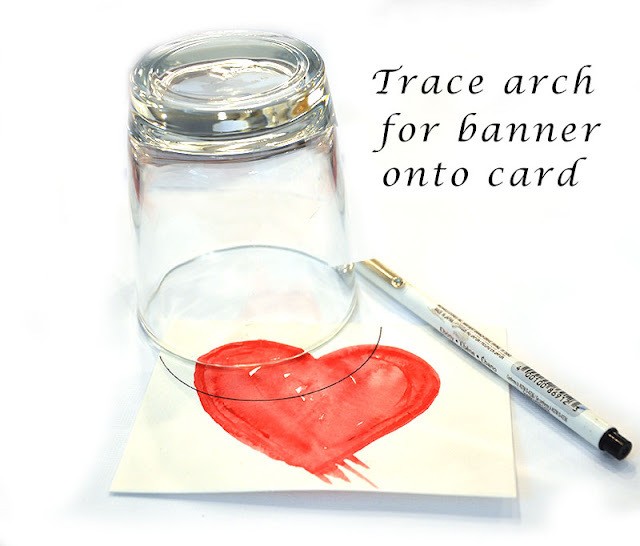 After the watercolors are totally dry, you can decide where you'd like the banner to go and trace an arch for the banner ribbon onto the card. I am a simple gal so I grabbed a glass from my cupboard and used that to make my perfect arch. No need to get fancy on this 10 minute project. Step 3. 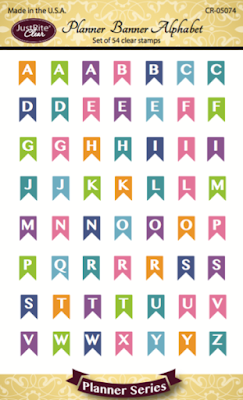 The arch will help you decide where to place your letters. 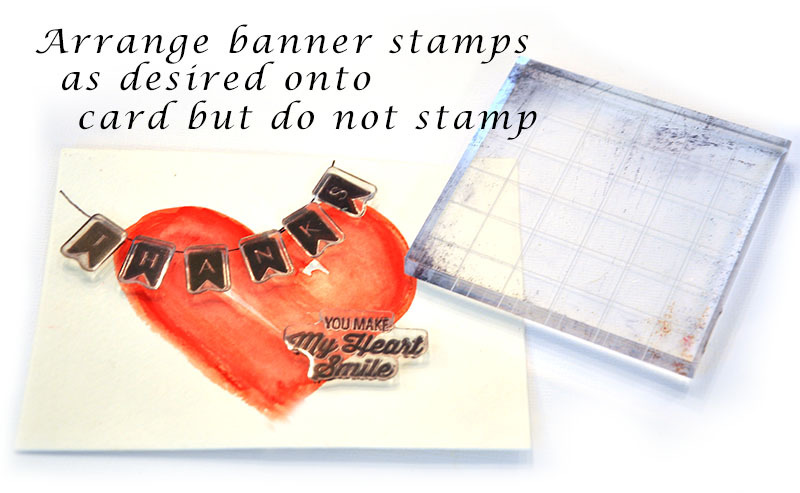 So much easier than guessing where your banner stamps should go (which is what I started out unsuccessfully doing). 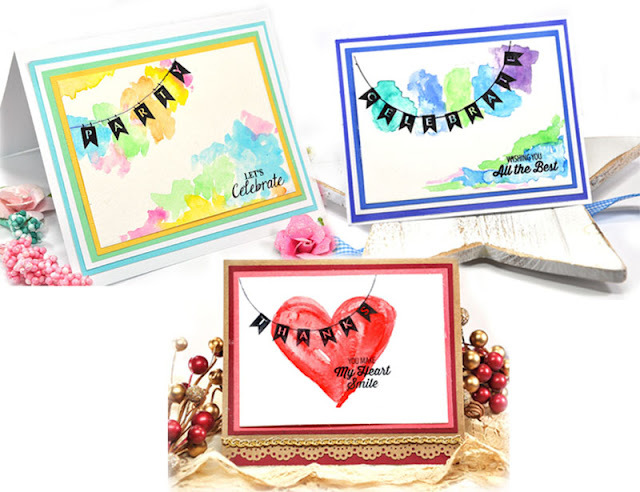 At this point, once the stamps are as you desire, pull out your acrylic stamp block. Do NOT stamp yet. I know you want to but fight the urge! Step 4. OK now you can stamp. 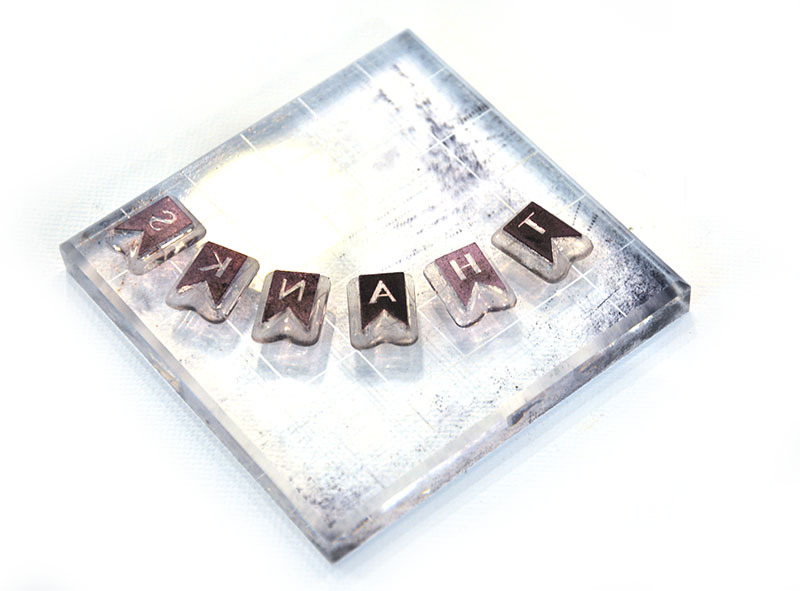 Place your acrylic block over the stamps and pick them up as a complete set. My suggestion is to do the banners and sentiment separately for better results. 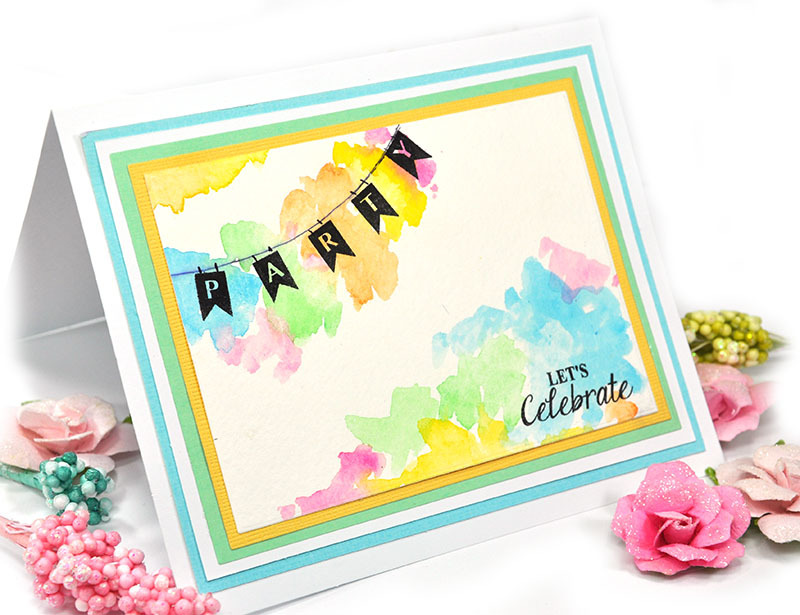 At this point, you need to make sure the watercolors are bone dry for the best stamping results. Step 5. 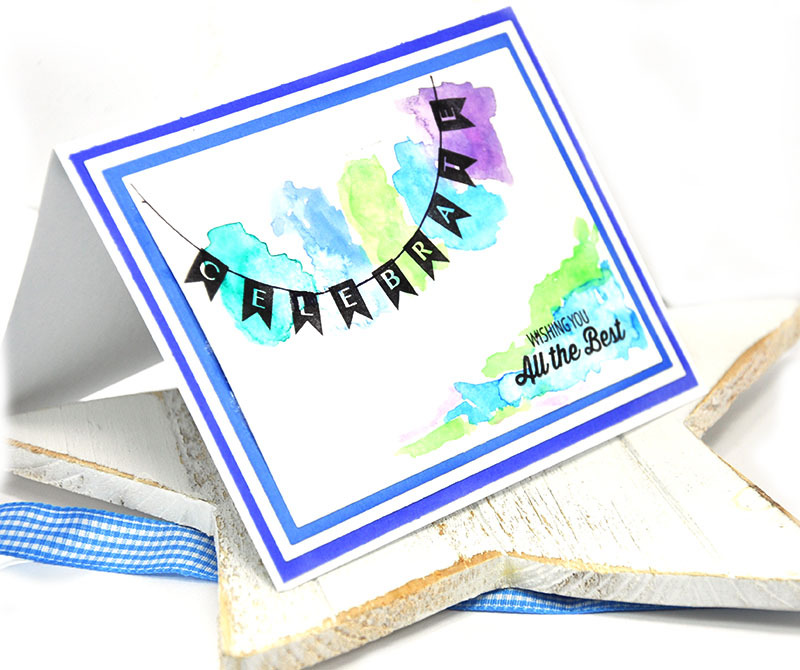 Use the JustRite A2 Card Front Basic Dies to quickly cut perfect colored background mats. Glue to pre-folded cards. 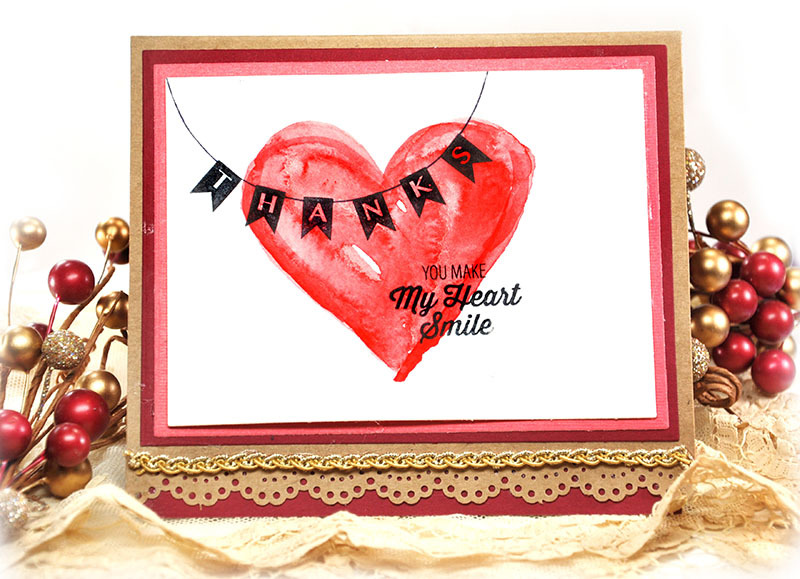 Continue to decorate the card as desired. The second card is bright and fun. I had graduation in mind yet it's so versatile that it can really be for many occasions. 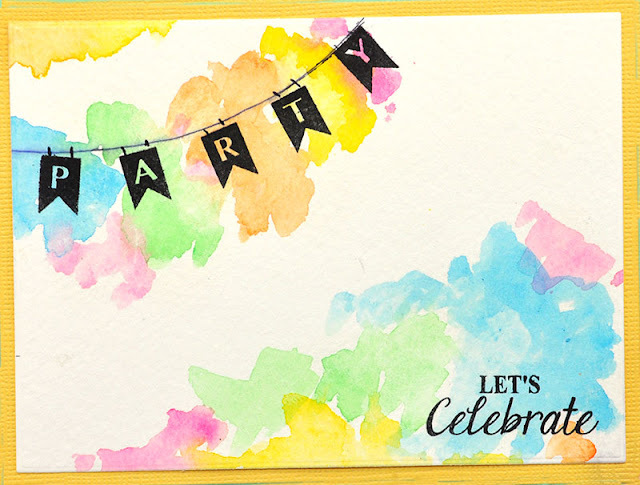 Card two and three are simply variations of the same card but show how colors ,make such a difference in the final result. These are the JustRite products used on card two and three. Once again, card three is similar to card two, just showing the possibilities. These are the products in card three. Coloring with the Prima Confections and paint brush. Thanks for looking and stopping. You can find all the JustRite dies and stamps right here. Great little tutorial. 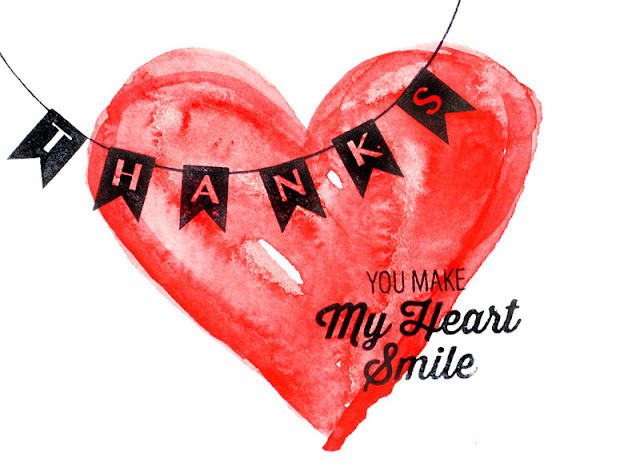 Thanks Love all 3 cards. Wow!! 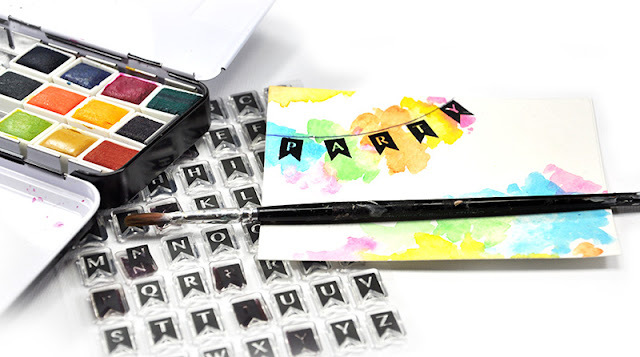 Such a clever way to use this stamp set! Thanks for tutorial! !